Your most inspired dreams have efficacy and purpose in guiding you to your own success and the better world you seek. In this concise, inspiring manifesto book, Amy McTear helps you to craft your most potent life by being absolutely true to yourself. We Need You challenges you to a higher accountability and a deeper sense of self-worth, empowering you to take responsibility for your own wellbeing and motivating you to bring your most vital contribution to life. Many people feel dissident with the conditions of the world today and are burdened by a bleak outlook on the future. They doubt whether their lives can make a difference. Heirs to a dispirited dream that promises an illusory security if they conform, they have been conditioned to make life choices based on fear, rather than inspiration. This approach has done little to yield true security or improve the conditions of the world. We Need You asserts that each person is not only capable of affecting a new reality for humanity, but accountable. A much deeper security is available through discovering and cultivating what matters to you most. Whether you are a few years out of high school or at a great turning point in your life’s journey, never has there been a more important time for you to live your own inspired life. “Whose life am I living?” This vital question rings through every word and image in this remarkable book. Amy McTear skillfully weaves together insights from transpersonal psychology, world mythology and spiritual insight alongside inspiring discoveries from her own journey into the richness of living a heart-imagined life. A poetic, wise and honest book that you’ll want to read out loud to yourself when you forget that the world needs you to be you. Amy McTear, in her insightful and passionate book, calls us to find our resonance in a world dominated by competition, greed and power. She has found a way by which we can re-connect to our higher purpose. As a singer, musician, and spiritual activist, Amy knows that music is the universal language, and it is a language of peace and ‘atunement’. Every spiritual tradition uses sound, voice and instruments, to create literal vibrations which can change our reality, and bring about harmony. The Chinese symbol for ‘crisis’ is the same as ‘opportunity’, and Amy, and many others on the path, have picked up the call. Her narrative calls us to find where we can tap into this healing, for ourselves and the earth. 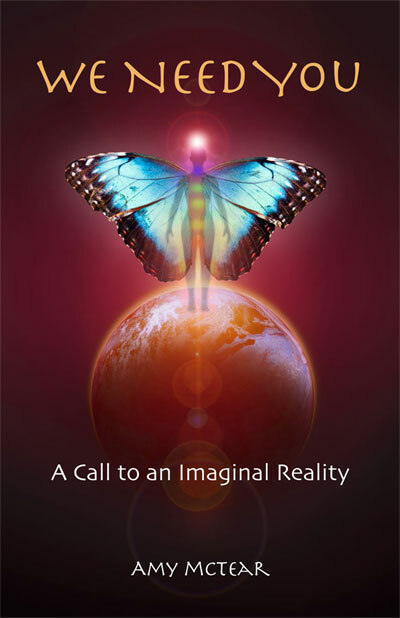 Beautifully written, with compassion and urgency, this book can be a motivating force in our evolution back toward oneness. -Puja A. J. Thomson, author of Roots and Wings and After Shock. This concise book offers a pathway forward for anyone feeling trapped by their own fears. It is an invitation to let go of these fears, claim your true self and trust the divine that lives within you. ~ Cylon George, College Chaplain, Hudson Valley Community College and Russell Sage College .